How do I apply a discount for bitcoin purchases in Magento? 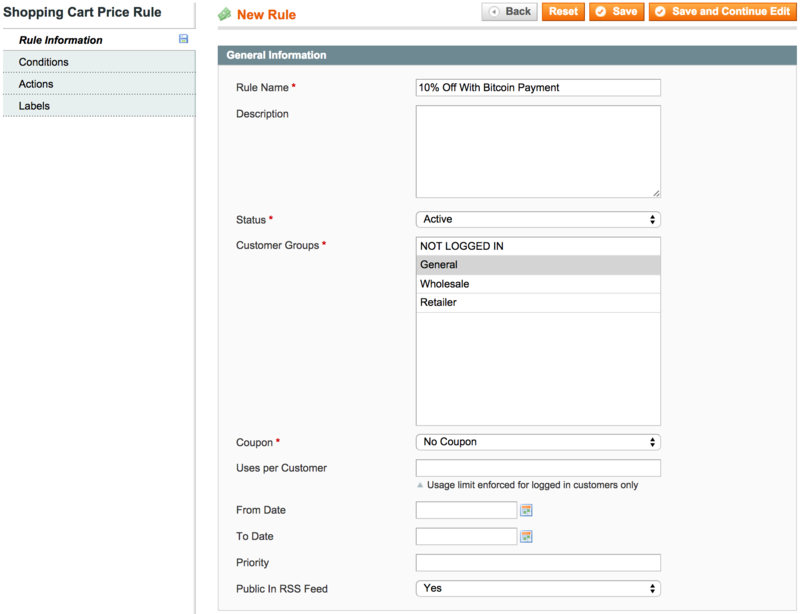 Magento's 'Shopping Cart Price Rules' engine allows one to create discount rules for purchases. This can be used to incentivize bitcoin purchases, as the fees to receive payments in bitcoin are typically greatly reduced when compared to other payment methods. As an example, these instructions will walk you through creating a 10% off entire purchase rule for customers paying with bitcoin. Log in to Magento's Admin Panel. In the top menu, select Promotions -> Shopping Cart Price Rule . Click the Add New Rule button on the top right. This will take you to the ‘Rule Information’ section. Give the rule a name, such as 10% Off With Bitcoin Payment. Select Active to enable the rule once it is saved. Select which Customer Groups to apply the rule to. Select whether a coupon code is needed for the rule to apply. Selecting No Coupon means the rule will apply without any action taken, as long as the conditions are met. If a code is entered, the customer will have to enter that code to receive the discount. You will also have the option to define the maximum total number of ‘Uses per coupon’ if a coupon code is selected. Define the number of Uses per Customer if desired. Select the date range for which the coupon will be valid. If this is left blank, the rule will be available as soon as it is created. Select the rule’s priority. This is useful if you have multiple shopping cart price rules enabled at once. 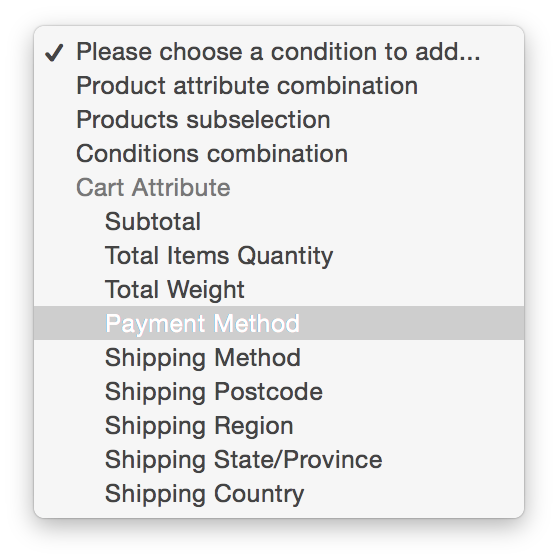 It tells Magento in which order to process the rules and can affect the total discount offered. Select whether the rule should be published in your RSS feed if it is enabled. Select Conditions from the left menu. Click the circle with the green + icon to add a condition. 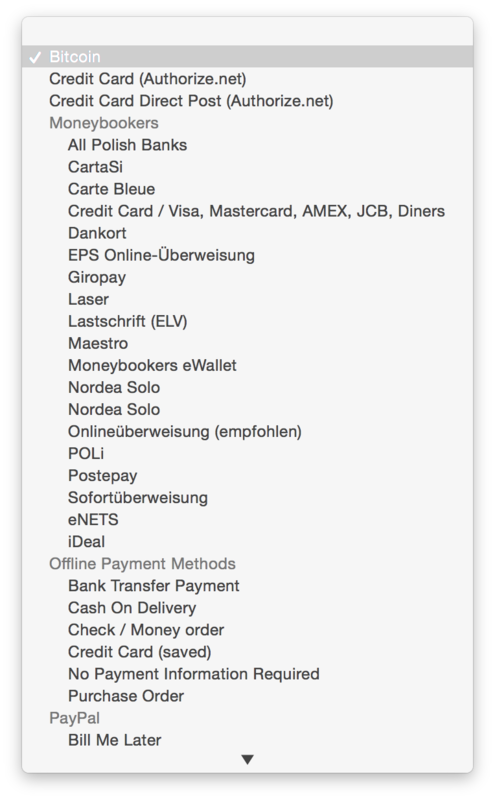 Select the ellipsis (…) and then choose Bitcoin from the drop down menu that is presented. Select Actions from the left menu. Next to Apply, select the type of discount you would like to apply for customers paying with bitcoin. For example, you would select 'Percent of product price discount' to offer a percentage off. In the next field (Discount Amount), select the percentage or fixed amount that should be discounted. In this example, we selected 10%. Unless a change is desired, the rest of the fields on this page can be left at the default settings. Click the orange 'Save' button at the top right to save the rule. If you selected 'Active' under the 'Rule Information' section, the rule will now be enabled. If you selected 'Yes' to 'Public in RSS Feed in the 'Rule Information' section, the rule will now be published to the RSS feed. How do I enable error handling & debug logging for the BitPay Magento payment plugin?